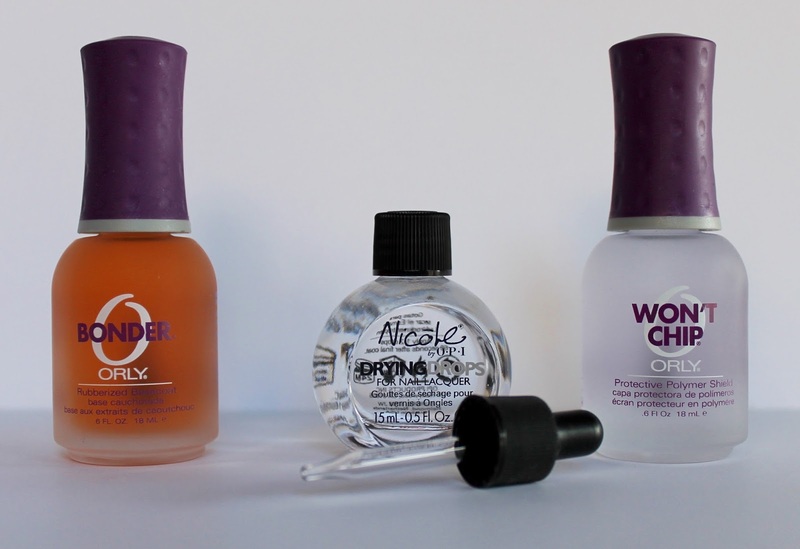 These are 3 nail products I have used for YEARS and the only ones I ever use when I do my own nails. I have been out of all 3 for WAY too long, so I finally ran into CVS yesterday specifically to buy these. I was using several other top/base coats I just happen to have while I was out of these. They left bubbles, chipped, and were plain awful. These are the absolute best. Orly Bonder - This is the BEST base coat you will ever find. Ever. Ever. Ever. What it is: a unique rubberized base coat that grips for lasting adhesion. It dries super quick to a matte finish. I truly notice a difference when I don't use this particular base coat. I also feel like it fills in ridges and imperfections in your nails for a smooth polish application. Orly Won't Chip - This makes my polish last for a solid week. When I get my nails done at the salon my manicure is literally chipping the next day, so I say a week is pretty remarkable. What is is: a protective polymer shield that helps nail lacquer chipping and peeling. My favorite thing about it is that it doesn't bubble (my biggest nail pet peeve) and it leaves my nails looking super shiny and glossy. Nicole by OPI Drying Drops - I really believe these drops help my polish dry faster and prevents nicks. What it does: with just one drop, nails are dry to the touch in 60 seconds and completely dry in 5 minutes. It is formulated with soothing Jojoba and Vitamin E to treat cuticles. It leaves my nails looking soooo shiny and cuticles are super moisturized. Trust me this stuff is amazing, you won't be able to do your nails again without it.